This dissertation develops new techniques of analysis that make existing archaeological data more useful for understanding past climate change. These techniques are introduced through three key case studies in the San Juan Basin of New Mexico, the Lower Alentejo of Portugal, and the Eastern Mediterranean. A 12,000 year record of pollen collected from packrat middens across Chaco Canyon were analyzed using a new normalization procedure to produce a Holocene record of piñon and ponderosa pine abundance. The normalization procedure, species occurrence, enabled statistical analysis of the data. Simple linear models indicated that piñon and ponderosa pollen were strongly correlated with each other. Bayesian change-point analysis was run, and a period between 5,440 and 5,102 cal. yr BP was identified as a point of expansion of piñon. 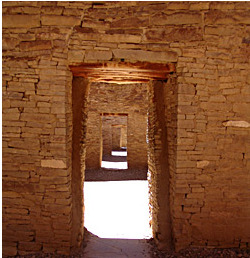 This expansion of piñon was contemporaneous with increased storage and territoriality of populations in the San Juan Basin around the same time period. In the Lower Alentejo of Portugal, a series of \u03b413C values from radiocarbon-dated pollen were used to calculate rates of 13C discrimination (\u220613C). These \u220613C values indicated a period of stability from AD 600 - 1000, increased arid conditions during the first half of the Medieval Warm Period (AD 1000 - 1100), and a return to normal conditions from AD 1100 - 1150. Following this, the rural Lower Alentejo was abandoned for almost two centuries. The data suggest a climate that was stable during a period of population growth followed by heightened variability during the Medieval Warm Period. This would have caused some drying out of soil, potentially contributing to later soil erosion as wetter conditions returned prior to the rural abandonment. Importantly, the study paired modern observations of \u220613C with archaeological data, establishing an approach to the study of data commonly available to archaeologists. Finally, in the Eastern Mediterranean, a set of regional paleoclimate records were used to better understand climatic conditions during the time of the Late Bronze Age Collapse (1200 - 1000 BC). At this time, most urban centers in the region were destroyed and abandoned during a period of depopulation. Alkenone-derived sea surface temperature records and warm species dinocyst/formainifera ratios indicate a cooling of Mediterranean waters at the time. Terrestrial paleoclimate records, including a biome-wide measure of \u039413C derived from radiocarbon-dated bulk pollen, indicate that conditions may have been more arid at this time. This study of paleoclimate reconstruction includes new techniques developed to make use of under-utilized data gathered by archaeologists. These techniques include the use of of radiocarbon-derived \u039413C as a local indicator of aridity, the use of biome-wide \u039413C from pollen as a regional paleoclimate record, a new normalization technique for pollen records, and the use of Bayesian change-point analysis to assess the significance of changes in a paleoclimate record. These new techniques can compliment archaeological research questions that require information about paleoclimate.